The tip line is live as of today; if you’d like to give it a try, beam messages over to +919643000888, and reply with ‘1’ when prompted to confirm that you want the previous message you sent to be verified. The move comes ahead of the Indian elections (and just a day after April Fools, nice touch), when misinformation campaigns are rife across the country. Beyond zealous civilians who may share bogus messages, political parties operate numerous (read: thousands) of group conversations to spread their propaganda – so the Facebook-owned messaging platform needs to engage every tool it’s got to curb the spread of fake news. WhatsApp explained that when you send a message to the tip line, you’ll receive a response informing you whether the information is true, false, misleading, disputed, or presently unverifiable as it’s out of scope – as well as any additional details related to your query. It’ll accept text, pictures, links, and video in English, as well as in Hindi, Telugu, Bengali, and Malayalam. 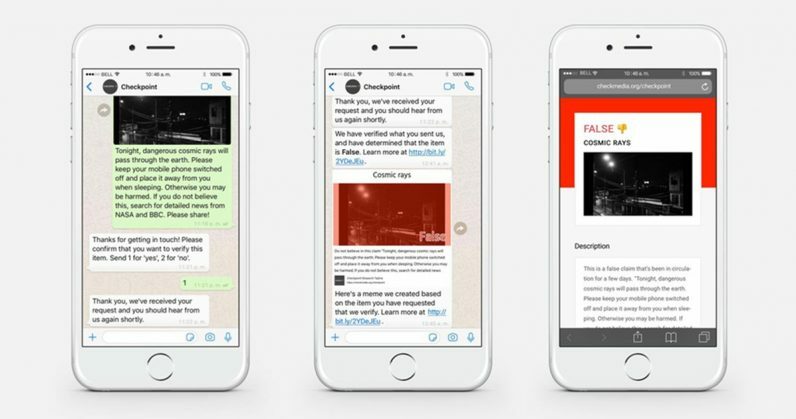 The startup notes that it’s looking to study how misinformation spreads on WhatsApp, and share its learnings with the International Center for Journalists to help other organizations and governments learn how to tackle fake news. It remains to be seen just how well this will work. Although I’d shared a couple of forwards with the tip line roughly half an hour ago, I haven’t yet heard back. If WhatsApp intends for this to serve as a way for people to identify fake news and avoid spreading it, there are two key challenges it’ll have to deal with. The first is speed; the longer it takes to verify information, the less inclined people might be to check their facts before forwarding them along. Next, the news of this tip line needs to reach a wider audience than just those reading tech blogs. It’d be good to see this built into WhatsApp somehow, either as a ‘Verify this’ option alongside the forward button in chats, or as a pop-up that encourages people to try sending rumors to the tip line before sending them along. Hopefully, the company will invest in offline initiatives to make more people across India aware of this feature so they can protect themselves from fake news during these sensitive times.